Blue Forest are pleased to announce that we have been commissioned to produce the designs for an exciting and imaginative multi-million pound treehouse development. 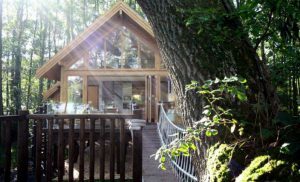 Aptly called ‘Nesting’, the scheme which comprises of 13 natural treehouses, 11 timber lodges and 40 glamping tents (for seasonal use) is being created at the award-winning attraction, Robin Hill Country Park on the Isle of Wight in the United Kingdom. Home to the world renowned Bestival music festival. The iconic design for the treehouses was inspired by nature and is based on the curvy and organic form of a Weaver bird’s nest. Consideration has been given as to how ‘Nesting’ can fit within the sensitive countryside environment. Mr Andy Payne , Founder – Blue Forest, said, “each treehouse will be positioned slightly differently within the woodland, perhaps rotated, sunken down within the valley or lifted up in the surrounding tree canopy. Like a cluster of fruit, the treehouses appear similar but not identical. They have been created to complement each other and will really come into their own when viewed collectively, sitting harmoniously within the landscape”. To ensure a sensitive design approach, Blue Forest are delighted to have engaged the services of architect’s practice, Tate Harmer, who specialise in sustainable designs that work with nature. By a careful selection of natural materials, the lodges and treehouses will blend into their natural surroundings, complemented by a sensitive landscaping scheme. The proposed treehouses will be clad almost entirely in sustainably sourced, premium grade Cedar shingles, giving an elegant yet natural finish. The combination of these neutral colours & textures has been identified as being particularly effective for helping the structures blend in with their surroundings. The cedar shingles used for part of the wall cladding will weather in a relatively short period of time to a natural silver grey colour. The development is to be sited in areas of Robin Hill which are currently unused or in need of regeneration. The proposed accommodation will nestle into the natural landscape of the park, maximising on the most stunning views across the valley and providing unique visitor accommodation. A planning application has recently been submitted by Vectis Ventures Ltd for the scheme. Phase One of ‘Nesting’ is proposed for opening Spring 2018. 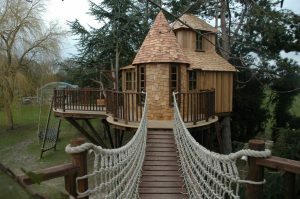 This tree house is a real Treetop Castle! The structure has been built approximately 3m off ground level at the base of the main tree. The peak of the roof on the tower reaches a height of approximately 7.7m from ground level.